JAFCA creates new values with "colors." JAFCA is an organization that promotes advancement in color design in the industrial sector and enrichment of colors in everyday living through its wide-ranging activities. Established in 1953 and evolving in structure since then, the organization has consistently delivered the latest information in color trends, while at the same time hosting seminars and workshops and providing trend color production service. Especially in the area of color trend information, it has won wide and longstanding recognition in providing reliable and accurate indicators in color design. The many activities and services of JAFCA consist primarily of research into color trends and selection and communication of the trends. Based on the pool of knowledge, the organization publishes color trend journals and palettes for each season, offers services in product color consulting and in educational programs, such as introductory workshops on colors and color schemes, and organizes seminars, forums and other events related to colors. Research and communication of color trends have been the principal mission of JAFCA since its establishment in 1953. 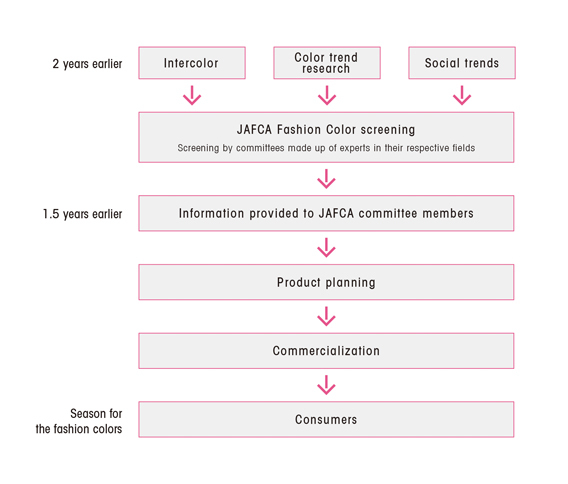 "JAFCA Fashion Colors" featuring the color trends in Japan's industrial sector are selected with experts in the respective fields and published for its membership. JAFCA utilizes its extensive pool of knowledge and network in the field in offering consulting service to meet diverse color-related needs, including market research, strategy planning, product development and employee education. JAFCA publishes a color trend magazine titled "RYUKOUSHOKU" to communicate information on color and market trends widely among its readership. Other important publications include research reports on color design catering to various industrial fields and color codes that are vital in color analysis. Reminars and workshops are organized to provide clear understanding of the latest color trends. Courses are also held for training ranging in level from basic knowledge to application in color design. The organization also sponsors the "Auto Color Awards" to promote the importance of color design. The study into color trends actually start two years prior to the actual season. Intercolor, or the International Commission for Color, was founded in 1963 as the only international organization dedicated to the selection of fashion colors. Representatives of member nations present their respective color proposals and work on the selection of colors yearly in June for the spring/summer season two years later and in December for the autumn/winter season for the same. The trend color selection at Intercolor is the earliest ever in the world and fulfills the role of the trendsetter in fashion colors to be announced later by nations around the world. 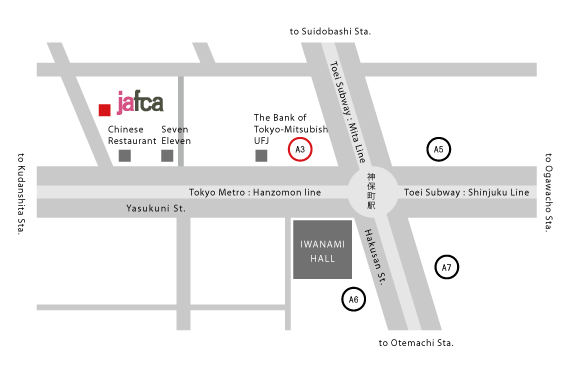 Japan has been involved in its establishment as one of its founders, and JAFCA has represented Japan since its birth. To gain Intercolor information, please join "Intercolor Japan Committee." JAFCA Fashion Colors provide the latest color trends selected by JAFCA for the Japanese market. The colors are selected by experts in Japan, based on global color trends. JAFCA Fashion Colors place importance of practicality of information and are published three times prior to the actual season with attention to market trends, in order to deliver the best suited color trends. The colors selected by Japan's top experts have had longstanding market trust for their effectiveness in application. JAFCA membership provides you a variety of privileges, including participation in color-related exchanges and programs mentioned earlier and access to highly trustworthy information on color trends. Membership types are the following. data on specific business segments. This requires the basic JAFCA membership. data　on more specific fields. Basic membership with JAFCA. Membership privileges include participation in JAFCA-sponsored study groups, projects, etc., discounts on color trend seminars and other events and invitation (without charge) to designated seminars. Newly introduced privileges that had been available only to Category members are JAFCA color-related consulting, development of seminars designed for member needs, assistance in lecturer dispatch, etc. This membership is recommended to parties wishing to participate in JAFCA activities and conduct exchange with other members. Business segment membership is required in addition to basic membership to obtain various data on trend colors that JAFCA publishes. There are 3 business segments, namely "Ladies' Wear," "Men's Wear" and "Industrial Products & Interior." When joining this membership type, each member is required to be part of one of these business segments and will receive trend color information for the chosen segment (JAFCA Fashion Color) twice a year. Three types of color information for each season are sent to members as shown below, at times staggered ahead of each season. All business segment members will receive the quarterly magazine "Ryukoushoku"four times a year. Under this membership type, members are able to participate in the activities of the "Intercolor Japan Committee" on global color trends, "Cosmetics Color Study Committee"and "Automobile Color Study Committee" in addition to the business segment privileges. Announced two years ahead of the actual season, Intercolor offers the world's earliest data on global color trends. It is in effect the driving force of color trends around the world. Participation in the color selection meetings is limited to one organization per member nation. JAFCA is the only body to represent Japan. Membership in the Intercolor Japan Committee will offer immediate access to Intercolor information. There are other benefits as well. 1. Participation in Intercolor report meetings/presentations: Report meetings are held in Japan following Intercolor color selection, for detailed presentations on the selected colors and distinctive features of the proposals of member nations. Held twice a year. 2. Distribution of reference materials on the selected colors: Color palettes for the selected colors; description of the color selection process; CD containing colors proposed by member nations and commentary on color trends; and selected spare colors. The committee engages in activities related to makeup colors. Its benefits are as follows. 1.Publication of makeup colors (semiannually): Colors for the spring/summer season and the autumn/winter season are published (twice a year). Members may also participate in the color selection committee meetings. 2.Study meetings: the meetings are held twice a year, with guest speakers invited from the outside to give presentations on themes that aid in makeup-related product development. 3.Reports & presentations on surveys of preferred makeup-related colors: Surveys are conducted on preferences in lipstick, eye makeup and other makeup colors once a year. Survey reports are produced, and the findings are reported at presentation meetings. This committee organizes independent activities, such as workshops to help expand perspectives in design/development, discussion meetings, study tours, auto body color surveys and sponsorship of the Auto Color Awards. 1. Study meetings: Workshops are organized on selected themes for training in creativity. 2. Participation in auto body color surveys and report meetings: Auto body color surveys are conducted once a year. Auto body color survey report is published based on data, color samples, etc., submitted by Subcommittee members. The findings are reported at meetings. 3. Auto Color Awards (awards given to outstanding car body color design, introduced in FY 1998): Members may participate in this special event. Members receive the quarterly magazine "Ryukoushoku" and may choose subscription to "Ryukoushoku" only. Annual subscription to the journal published four times a year. Modified A4-size, with full-color in approx. 80 pages. ● Intercolor and JAFCA colors ● Analysis of market color trends for each season (ladies' wear, men's wear, interior decor fabrics and household appliances) ● Trends in European and New York designer collections ● Analysis of market color trends for each season (ladies' wear, men's wear, interior decor fabrics and household appliances) ● Trends in European and New York designer collections ● Articles on topics such as background stories on colors that became explosively popular, color trends in various fields, new lifestyles and others related to color design. Please select the membership plan of your choice and submit your application. Upon receipt of your application, we will send you an invoice either by fax or email. Payment must be made in Japanese yen to our bank account. Our publications will be sent to you regularly and on a timely basis upon confirmation of your remittance.